Filming for the next season of PartyPoker Late Night Poker starts on the 23rd of October. It will take place in Cardiff and will be filmed until the 27th of October. After different formats in recent years the tournament will go back to the successful format that was used from 1999-2002. There will be increased emphasis on the player's personalities. The program will return to television on Channel 4 in the UK and Ireland early next year. The familiar Late Night personalities including Dave "The Devilfish" Ulliott, the Hendon Mob, Padraig Parkinson, Donnacha O'Dea, Marcel Luske and Simon Trumper will return. Also competing will be well known 2006 WSOP Main event Champion Jamie Gold. Gold took down $12 million for his win at the richest poker event ever! Also taking part will be WSOP Europe Main Event winner Annette Obrestad from Norway, Rene Mouritsen, Roland De Wolfe, Robert Williamson III, Jen Mason and Jon Kalmar. The addition of these first time competitors will add fantastic depth and intrigue to what will be a world class event. There will also be two relative newcomers taking part that could make for some entertaining footage. Holland's Maud Muller, who finished second in the original Pop Idol series and has had hit chart records will be playing. Muller burst onto the scene winning her first ever major event. Joining Muller is well known Polish television journalist Agnieszka Rylik. She should be well prepared after receiving coaching from Mike Sexton in Las Vegas. A PartyPoker spokesman said: "We're happy so many of the old faces are back and are pleased with the line-up. There is also going to be a celebrity special table filmed the same day as the final – details of which will be released in the near future." 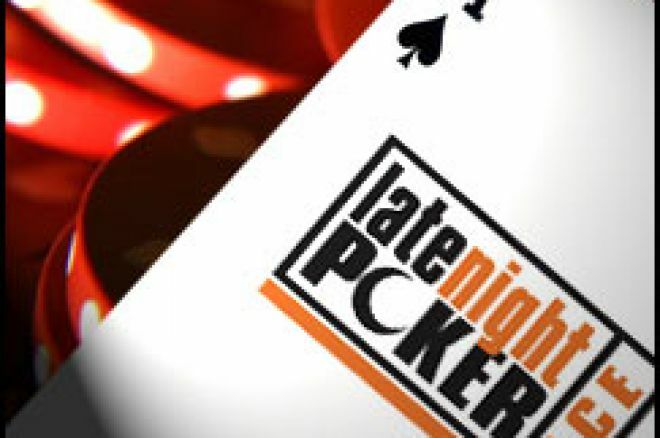 Rob Thomas, producer of Late Night Poker for production company Presentable said: "The convention for every poker show these days is to show all the player's cards as soon as they enter a pot. When Late Night Poker started, the style was very different. Player's cards were revealed at appropriate moments during the hand to create more drama as the hand progressed. Twice in each show we will see the hand from one player's perspective. We'll only see their particular hole cards which gives the viewer a different perspective as the hand develops. TV poker is about creating drama and tension and, in these instances, the commentators will have great fun guessing what the opponent might be holding, and then there's the excitement of the "reveal" moment at the end of the hand. We believe this will enhance the viewer's enjoyment." Late Night Poker was the first televised tournament to feature under the table cameras. When they did this in 1999 it changed the way poker was going to be televised forever! This years coverage will be filmed by Presentable and will be presented by Vicky Coren. The tournament director will be Thomas Kremser. The total prize pool for 2007 is $335,000 ($90,000 added by PartyPoker) with $125,000 going to the eventual winner. The tournament will feature seven heats with seven players. There will then be a semi final and a final. The 49 players will be paying a buy-in of $5,000. The field of 49 will include ten players who won seats on PartyPoker.